"I feel like my talent has been suppressed in some sort of way," says north London rapper Little Simz. "I've got all these odds against me, but when it comes down to it, I am actually very good at what I do." The 25-year-old, born Simbi Ajikawo, is one of the UK's most versatile and respected rappers, but she's never quite had the success of her contemporaries. Maybe it's because she's a female artist in a male-dominated space; maybe it's because she insists on self-releasing her records, or maybe it's because her eclectic, genre-hopping style couldn't find a home on UK radio. 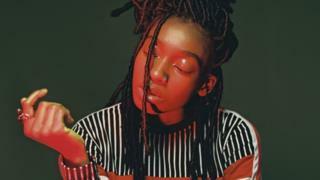 From the fierce thunder-crack of Offence to the reflective, vulnerable Flowers, it's constantly surprising, and consistently inventive, with Simz pitting her dextrous wordplay against a live band for the first time. Playlisted by both Radio 1 and BBC 6 Music, it's also the highest-rated album by a female artist this year, according to review aggregation site Metacritic (only Psychodrama, the debut album by fellow London rapper Dave, has a higher score). "I'm not gonna lie, I'm really happy it's been getting all the love it has," beams the musician. Ahead of her performance at the 6 Music Festival in Liverpool, Simz sat down to discuss her late-blooming success and why she's as good as Jay-Z. Image caption Little Simz: "One thing I was keen on, was making sure this album translates well on the stage"
There's been a huge buzz about this album. Do you feel the difference? Yeah, I do. Even though I had two albums out prior to this one, it feels like I'm re-introducing myself. There's no code, there's no conceptual stuff, it's just straight cutting all the way through. I looked at the album credits to find out where you got all those fantastic funk samples but it turned out there weren't any - it's all you! Haha, I know! That was all down to Inflo [Simz' childhood friend and producer]. He's just talented, man. He can make you feel like you've heard something before when it's actually brand new. I've always wanted to use live drums and live bass, but when it got to it, I was like, "Uhhh, I don't know if this is what people want to hear from me". The first song we started was Offence and... it's not that I didn't like it, but it made me uncomfortable at first. There's so much going on - flutes and cartoon noises and strings - it was important for my voice to not get lost. But once I got going I was like, "OK, I've found where I sit in the song". It's such a strident, confident track. I love that line, "I'm Jay-Z on a bad day, Shakespeare on my worst days". It's a bit tongue-in-cheek, but there's truth in it. I genuinely feel like I am that. Why not? They're both incredible writers, and I kind of feel like I am, too. Yeah, as much as I'm from London, and very influenced by our scene, I was listening to Busta Rhymes and Ludacris and Nas. I don't like feeling I'm bound to a London sound just because I'm from here. It comes from understanding that I'm speaking to people, not speaking at them. If you remove the instrumental and strip it down to the words, I'm just telling you my story. Venom came from a build-up of anger, for want of a better word. Even though I sound very calm, there was all this tension I'd been withholding from feeling like, because I'm a female, I'm not superior. I know I'm very gifted but I don't get the credit I feel I deserve. It's striking that there hasn't been a female equivalent to Stormzy or Kano or Skepta yet. That's exactly it. There are some really great, amazing women that have not had as much light shone on them for whatever reason. And Venom is me letting out those frustrations, and saying exactly how I feel about that. Do you feel there's a change coming, with artists like Lady Leshurr, IAMDDB, Stefflon Don and yourself? Yeah, I think there's been growth, and it's coming into fruition, but I still don't feel like it's at the forefront. It sometimes feels like there's a higher bar for female artists. Yeah, it's almost like you've got one album to get it in the bag and if you don't, people move on - which is sad, because I don't think you're always going to get it right that one time. My first album wasn't my breakthrough. If I'd been signed to a major record label, that might have been the end of my career. Tell me a bit about the artwork - didn't you shoot the single covers yourself? Photography is something I've always enjoyed, so I invested in a camera just to document the fact that I travel around the world and have so many incredible experiences. So, one day, I had the idea to have four young girls in army gear and helmets screaming - and I reached out to my friends' nieces and cousins and we just done it. I'm so happy with the results. In fact, I just got these huge prints of the pieces delivered to my house. It's like, "Wow, I can't believe this was my idea and I followed it through and now it's in front of me". Not to toot my own horn, but I'm just really proud of it.